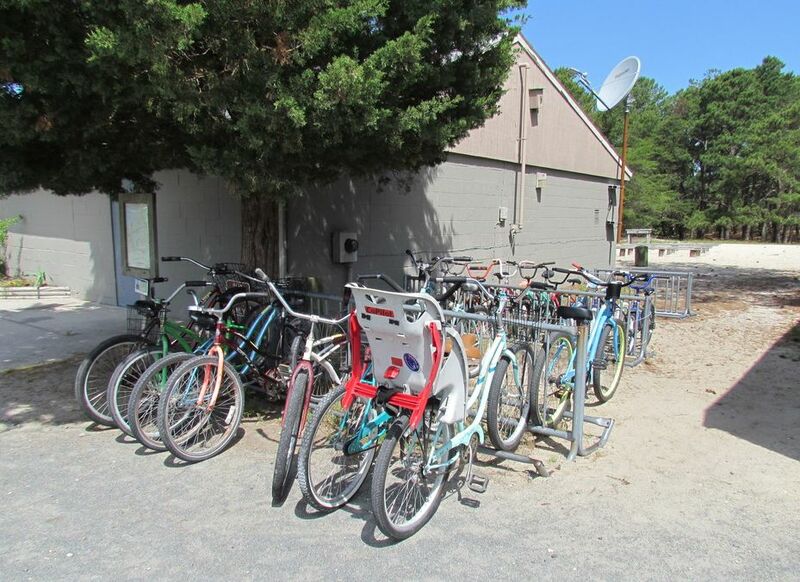 One of the most popular facilities provided by FOCHSP is Borrow-a-Bike. Here people can borrow a bike to ride within the park and see the sights for up to 2 hours...at no charge! That said, we do gladly accept all donations to help us offset the cost of new bikes, helmets and maintenance. Since its start in 1997, Borrow-a-Bike has always been operated by volunteers and funded by donations. In 2014, bikes were borrowed by more than 13,000 people and in 2015, that number was more than 14,500. 2017: Over 15,000 happy bike borrowers! ​To allow everyone to get a chance to enjoy our beautiful park, there is a two hour limit on borrowed bikes. There is no charge for borrowing a bike, but donations of any amount are very much appreciated to help offset the cost of new equipment and parts. Borrow a bike by registering at the Nature Center with the park staff. You must present a Driver's License or some form of picture ID and fill out a short form. Groups of up to 10 people are allowed per registration. Riders must stay on the designated bike trails and are not permitted to take bikes outside of the park. Bikes should not be left unattended. Helmets will be provided to adult riders on request. Under Delaware State Law all riders under the age of 18 must wear helmets while riding. You may also bring your own helmets. ​Weather permitting we are usually open every day 9:00 am until 4:00pm: Memorial Day until Labor Day. Rest of the year: 9:00am until 3:00pm. Closed Mondays & Tuesdays late October thru the end of March. The Borrow-A-Bike program began with a plan in 1997 and has always been operated by volunteers. 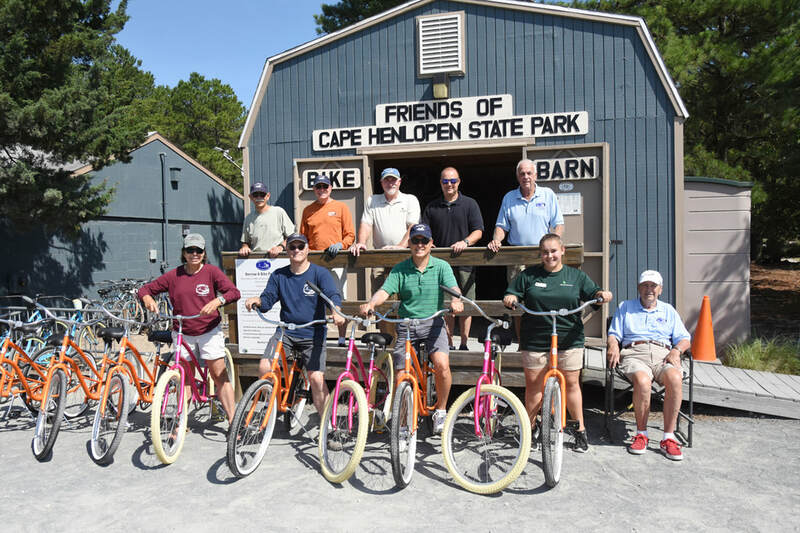 In 1999, a $3,000 grant from The Delaware Bicycle Council enabled the purchase of 15 bikes that were housed in a shed built by the Lion’s Club. Additional donations — including $1,000 from Dupont — increased the program to 35 bicycles operated from a new shed supplied by the Friends. The current "Bike Barn" which stands next to the Nature Center was built from scratch in 2009 by Friends volunteers under the leadership of Stan Lemiska, Chuck Moore, and Carl Lofgren. Today, the program includes more than 40 adult bicycles, including 2 with baby carriers, 12 children’s bicycles, and 2 double baby trailers. Due to the popularity of the program a second Bike Barn has recently been built behind the existing one. This will also free up much needed space for the ongoing maintenance and repairs of the bikes. We always need volunteers to act as "ambassadors" who help our visitors select the right bike for their needs, and/or as mechanics to service and make running repairs to our fleet. If you would like to volunteer and want to know more about what is involved please stop by the Barn which is next to the Nature Center anytime we are open , or go to "contact us" on this site and call or email us. You will receive a very warm welcome to our group for however much or little time you are able to give.